The Sony Alpha DSLR-A390L + DT 18-55mm lens is a camera kit designed around a 14.2 MP CCD and is aimed at the amateur and beginner photographer. It features a BIONZ image processor to help capture shots at up to 2.5 frames per second and the body of the camera has a smooth, stylish design and is very lightweight. For great auto-exposure it has a 40-segment metering system along with Sony’s D-Range Optimizer to balance things out in case your subject has very tricky lighting. For example, sometimes your subject is heavily backlit or the overall shot just has extreme lighting conditions. In these cases, the D-Range Optimizer will pull back the exposure on the bright parts and increase the exposure on the darker parts automatically. The sensitivity of the A390 ranges form ISO 100 all the way up to ISO 3200, so you can take pictures even in very low light. 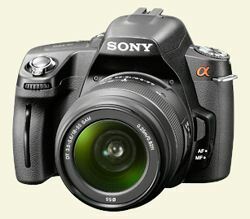 The Sony A390 also has a very sophisticated noise reduction system to keep the pictures clean at high sensitivities. To keep your shots steady and crisp, SteadyShot INSIDE stabilization technology is included and built into the camera itself so it will work with any lens. Many style settings allow some quick creative expression such as Landscape, Night View, B&W, Adobe RGB, Sunset, Standard, Vivid and Portrait. Scene selection modes allow a great shot to be taken quickly in a number of challenging situations like Sports, Night View, Sunset, Macro, Landscape and Portrait. To keep the CCD working well for longer, a static-free anti-dust coating is placed on the CCD filter as well as a vibration feature that shakes each time the camera is turned off to get rid of any settled dust. The Sony Alpha A390 comes with an integrated on-screen help guide to not only guide new users through the functions and controls of the camera, but to teach the basics of photography as well. There is a fully assignable button labeled Fn (function) and this is freely assignable to a number of different features enabling you to have one-button access to your favorites and not have to dig through menus every time. It is compatible with the PhotoTV HD system allowing your pictures to be viewable on a Sony Bravia HDTV in a thumbnail format. Otherwise you could connect Sony Alpha A390L via an HDMI cable making your images viewable in full high definition. 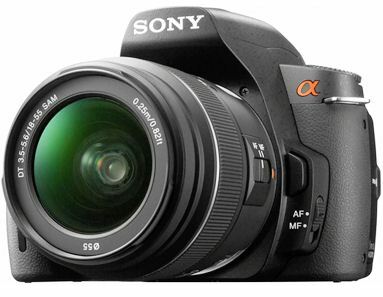 The Sony Alpha DSLR-A390L comes with a great lens too, the Sony SAL-1855 18-55mm f/3.5-5.6 DT AF lens. It’s focal length (when equivalent to the full 35mm frame standard) is 27 – 82.5mm. It ‘s really versatile allowing the beginner to shoot any type of shot from right up close to something very far away. It can take Memory Stick PRO Duo and of course SD and SDHC cards. It features a nifty pop-up flash as well as a hot shoe for TTL and Sony flashguns. The LCD is 2.7 inches in size and can tilt up or down for different camera angles. The A390 has a 9-point auto-focus system that helps to capture super-sharp images. A really smart feature is the ‘eye-start’ mode which makes the auto focus start working as soon as the camera is lifted up to your eye. The NP-FM50 InfoLITHIUM can handle up to 500 shots before draining. The Sony Alpha DSLR-A390L + DT 18-55mm is a great camera for the beginner, it has excellent features and the price is right at around $450.